Paul Shaffer, Bette Davis, Bob Jenni. Roger Ebert, Chris Elliott, Bruce Kapler. Marv Albert, Bette Davis, Al Green. David Letterman - Host: [speaking via megaphone] I'm not wearing pants! 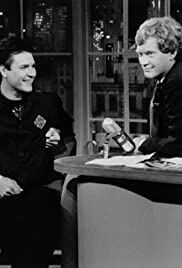 While Conan does have one of the best shows on TV now, David Letterman's original Late Night talk show is what created it all. This is where such classic things like "Stupid Pet Tricks" and "The Top Ten List" were born. Dave knows what people want to laugh at, and from that show he did it all, like once leaving an audience member as host for nearly the entire show while he "looked for his fake teeth" and other great things. David Letterman's current show may get more viewers, but this one should never be forgotten.